Got Ink? Comp And Save at CompAndSave.com sure does! They’re one of the top online retailers offering ink for less. With top brands including Epson, Dell, HP, Canon, Brother, Kodak, Lexmark, and more, CompAndSave.com is sure to have the brand of ink you are looking for. If you need laser toner cartridges, they have those too, as well as a variety of printer accessories including photo paper and printer cables. With next day shipping and a money back guarantee, you can rest assured your purchase from Comp And Save is high quality. Find the highest quality coupons at RetailSteal.com with the latest Comp And Save coupons, Comp And Save promo codes, and Comp And Save discounts. Free shipping on US orders over $50, or $3.99 flat-rate shipping for all other orders. Comp and Save ships via US Priority Mail and FedEx and provides a 1 year money back guarantee on all printing cartridges. See site for full details. Use this coupon code at CompAndSave for 20% off purchases over $100! 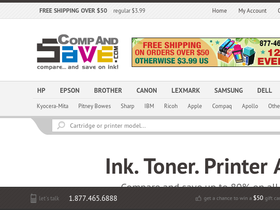 Click here for this great offer on printer ink and more. Use our coupon code at CompAndSave this month to save 15% on any purchase. Get 12% off the entire store when you use this coupon code at CompAndSave. Use this exclusive coupon code on CompAndSave to save 10% on your entire order. Click to save. Take $35 off your purchase of $150 or more at CompAndSave.com. Click here and use code for savings. Use this coupon code to get 10% discount on your next purchase from CompandSave. Click to save. Head on over to CompAndSave to save up to 75% on Combo Pack Deals. Click link to view. Shop online at CompAndSave.com and enjoy free shipping on your order of $50+.